With patented optical brighteners, green tea and chamomile. For white dogs, cats and horses. Contains no bleach or peroxide. Won’t irritate skin. 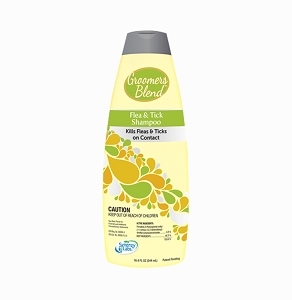 Non-yellowing, UV protection, removes stains with repeated use. 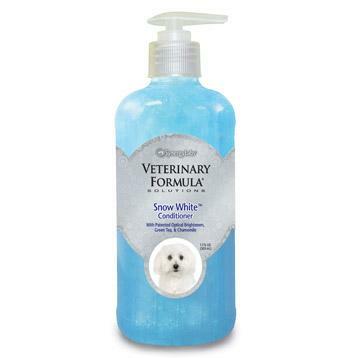 Pair with Veterinary Formula® Snow White™ Shampoo for ultimate sales with bright white results. 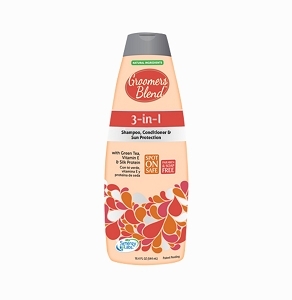 After shampooing, apply conditioner and massage thoroughly deep into the coat. Allow to remain on pet for several minutes for best results. Rinse well. Safe for puppies and kittens over 6 weeks. Deionized water, polyquatemium-37, PDF=150/Decyl Alcohol/SMDA Copolymer, Cetrimonium Chloride, Polysorbate-20, green tea extract, chamomile oil, benzophenone, fragrance, patented optical brightener, DMDM hydantoin, tetradosium EDTA, FD&C blue #1 and natural pigments.